Buddy and I went out for a quick fish today. It started with ice pellets and soon turned to rain. Not a bad day. 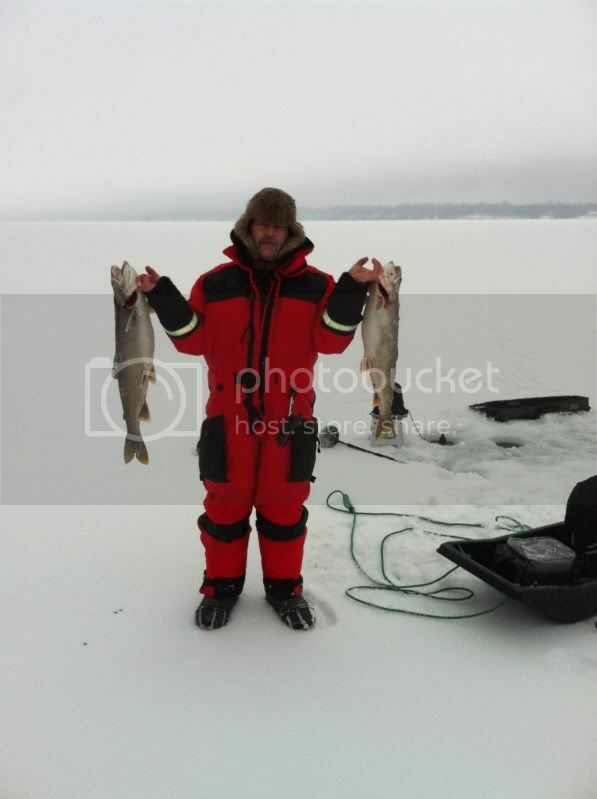 My buddy had a good day on the ice. We headed home at noon. Awesome! What lake, if you don't mind me asking, were you fishing? Not that I think I'm anywhere near you. What were you using for bait? We were on Lake Simcoe in Ont. We used a 3" tube jig. Black top white bottom. Large jig inside. 8 lb Floro leader tied to a swivel with a main line of 12 lb Mono. My buddy uses braid. 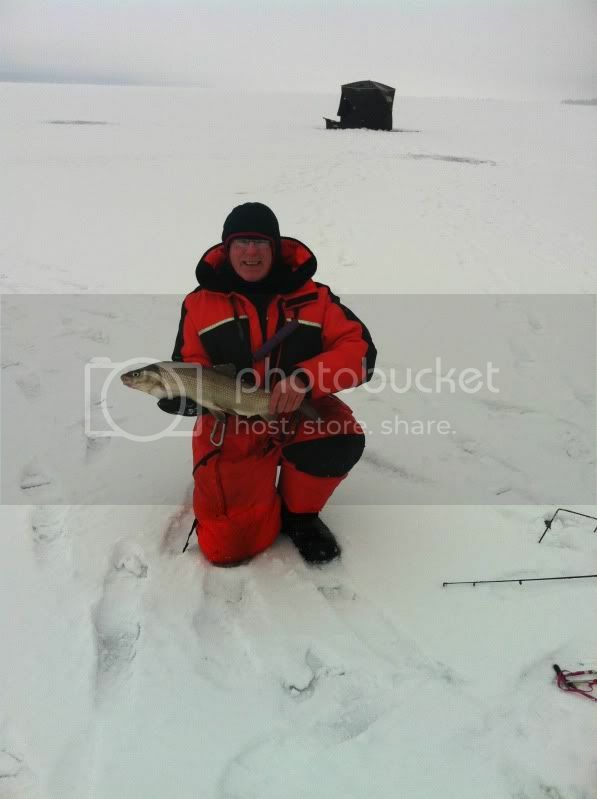 It was -25C with a nice little breeze, we had a great day, considering we didn't catch anything. For Pike try around 12 ft of water. Look for point of land and set up there. Between two saddles like two islands or where the water gets shallow the deep again. Ontario out of doors has a great web site which will help you catch the species you want to target. Ice Shanty. Com is another good one to learn off. A quick strike rig with a dead or live sucker minnow works good. Nice bunch of fish RR. Those tube jigs are real common around Lake Superior as well. I was wondering if you ever tip them with minnows or some strips or do you fish them bare? Thank you ravinerat, It is exactly where i was... we set up all over that transition of deep and shallow, need to try again. We had a few different lures, like Swedish pimples, jigging rapalla and a few other one, I need to get at it again next week end if it warms up, -35 today and a little breeze to cool that down even more. go to the grocery store and get some stinky whole smelt. Use a quick strike rig and just let them sit on bottom. (Google quick strike rig). We usually don't tip the tubes with anything. Some of the Yum Yum tubes come with a garlic sent. We also use Bad Boyz and lots of williams lures. We just find what works. I use a Vexilar and i can see the fish checking out my tube. If they aren't taking it then I switch up to something else. Every day is a new day. Maybe Hutchy can give you some pointers. I don't fish pike too much..
Nice looking fish, what are you guys going to do with them? Smoke them? I'm ashamed I haven't gotten out yet and put all the advice you've given me to use yet. Soon, hopefully. Nice! Lake Simcoe is a fish factory! I have not fished yet - the lake skiing has been too good! What are you wearing? Is that a snowmobile suit? 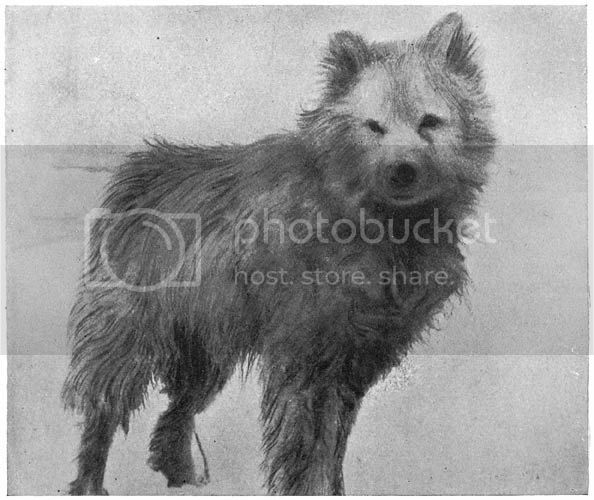 And what kind of fur hat? Looks really warm. What kind of fish are those? I take it the skinny one is a pike. Is the other one a lake trout? Well they usually get eaten. I don't eat a lot of fish just because my family won't eat it. I only bring home the ones that can't be released. I always say I am going to buy a smoker since the Whities taste best when smoked. The lakers usually make it to the BBQ. You know there is never a dumb question. The suits we are wearing are Floater Suits. It is like wearing a body PFD. There are many types up to survival suits. In Southern Ont when the ice is new/thin I always wear one. It also keeps the draft from going up your back when standing on the ice all day. Although I have worn it on the snowmobile it doesn't breath and you'll sweat with any exercise. The fur hat Dan is wearing is just Rabbit fur. You can get them at any store like Canadian Tire. 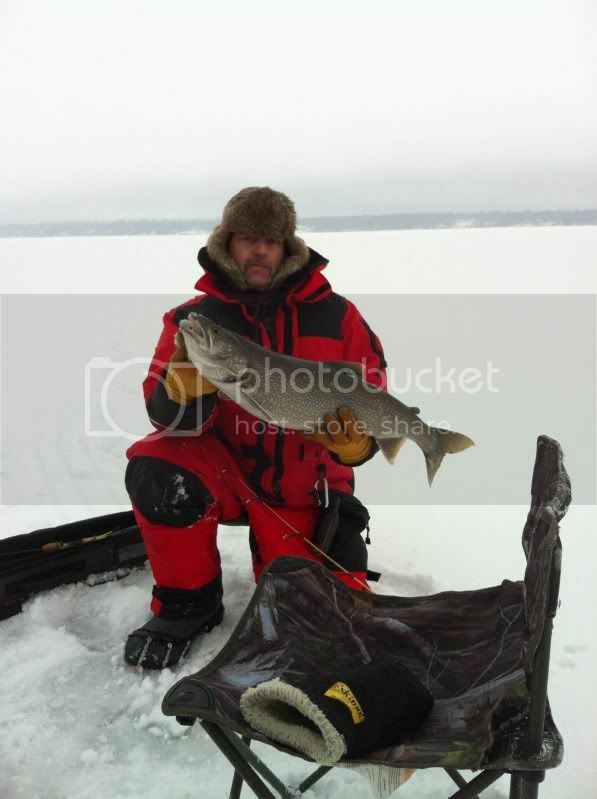 The first pic is a Lake Trout. Second pic is a White fish. 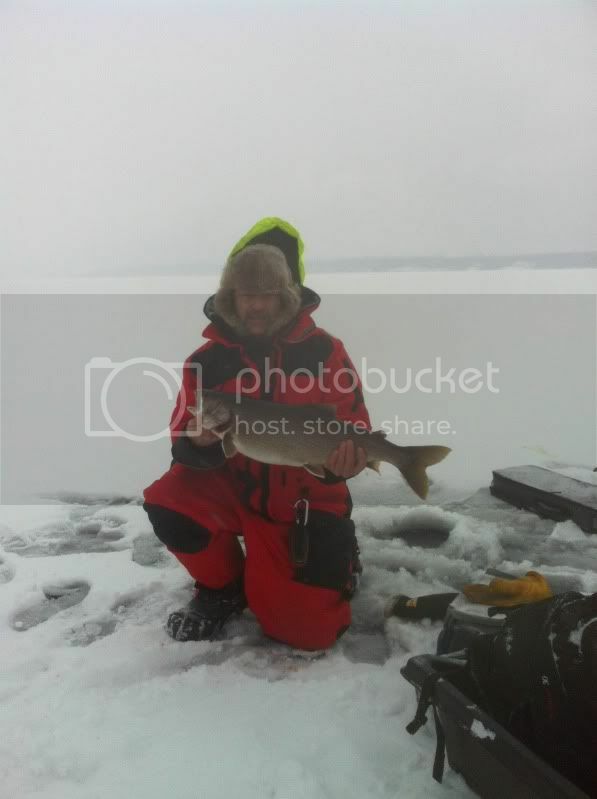 The third pic is a Lake Trout. Dan is holding both his Lakers. We were north of you on Lake Couchiching on Friday and Sunday perch'in. Btw, where did you guys access and how far did you walk? How deep were you fishing and how much ice were you on? Where we were, ice was about 8" in 10-20 FOW.